It's a last line of defense. The market has become incredibly saturated with new SaaS companies trying to grab a foothold. Small to mid-sized companies are doing anything they can to gain customers, and this is why you must always be aware of this threat to your business. While your sales team gains customers, you must establish a team to make sure your company retains them. Here’s a fun analogy: Do you drink coffee? Imagine your sales team is a coffee scoop, the filter is your retention team and the coffee grounds are your customers. The sales team brings in the customer, and the retention team's job is to not let them slip through. I’m sure you can understand how vital it is to have measures in place to retain your customers’ business, and support them. Your sales and marketing teams have a tough job—they are constantly trying to gain more customers. Once they’ve closed a customer, it’s the retention team’s job to keep them happy. By creating such a team, you lighten the load on your sales team, ensuring that they can focus on one thing and one thing only: new business. If you stretch your sales team too thin by giving them a quasi-sales-and-retention role, mistakes will happen, and customers will feel like their concerns aren’t being answered. Breaking up these efforts into different team responsibilities gives the sales process to one team, and the retention process to another It also provides an even workload on all employees. Retaining customers is just as important, or more important as gaining them, so you need a dedicated team to perform these tasks. It allows customers to be creators. You want to innovate your product or service going forward, right? Have you determined what you would like to change? What to keep? How do you think your customers will feel about these changes? These are all questions that development teams ask themselves as they move their Saas product forward. Your current customers are the biggest source of information about your product. They know what they like about the product, what they dislike and what they want changed. Take time to send surveys and ask for insight into your product. Show them you care, and value their opinion. A retention strategy makes more "cents." 1. Turning customers into brand ambassadors. Brand ambassadors are vital to the success of your product. They are your external promotional team. The more they enjoy your product, the more they share that affection with their peers. They have the power to refer future sales. 2. Identifying opportunities for up-selling and cross-selling. A happy customer is happy with you, the product and your relationship. They are always open to new products or ideas from your company. So when your company creates it’s next ground-breaking product, remember your happy customers might be the first ones to contact you for purchase. 3. Understanding the cost of customer acquisition versus customer retention. Customer acquisition is costly because they must be persuaded to purchase your product or service. You must provide support for them, as the list of items necessary for onboarding grows. Retained customers already know the product, were onboarded and need no persuasion. It costs between 4 to 10 times more to acquire a customer than to retain them. I hope I shed some light into why your company needs a retention strategy. A structured strategy is key to your company’s success. Retained customers are happier and are a constant source of revenue. Cherish their business, and make sure it doesn’t disappear. 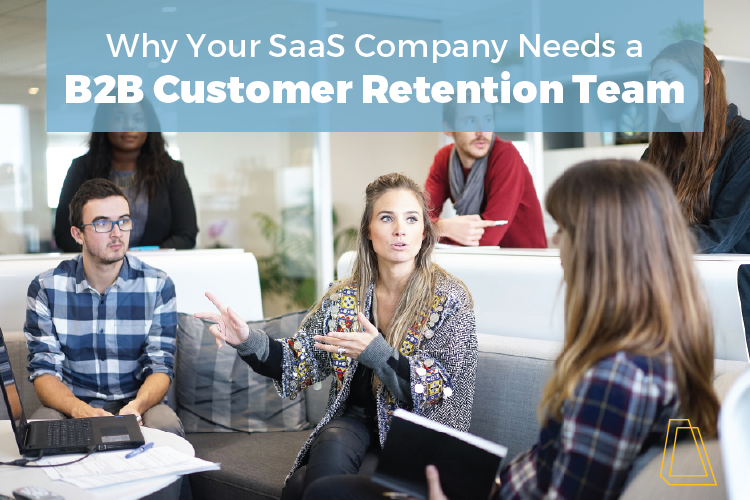 Have you considered a B2B customer retention strategy at your company? Do you currently have one? What results have you seen from it? Let me know in the comments below. Looking to build a B2B Saas retention strategy? Contact Milwaukee marketing agency, Accelity Marketing.